The gadget: The GigaPan Epic, the famous mechanism behind the 1,474 megapixel ubershot of the Presidential Inauguration that allows a standard digital camera to take massive landscapes. The price: $380, plus your point and shoot digital camera of choice. The verdict: The Epic really is an interesting product, but it's lacking the polish and execution that most of us expect in a $400 gadget. Let me explain. The Epic is essentially a robotic arm that automates the process of large scale digital photography. Attaching to a tripod (or just sitting on a solid surface), you show the system the top left and bottom right corners of a landscape, and it will automatically tilt and pan your camera, snapping all necessary shots with a tiny arm that pushes down your shutter button. You download the 100s of pictures from your digital camera to proprietary GigaPan software, and it will, over a few hours, stitch the photos together into magnificent landscapes. And it works! With a few caveats. You'll need to lock your camera's zoom, focus and exposure down, lest various pictures be lighter or darker than others. 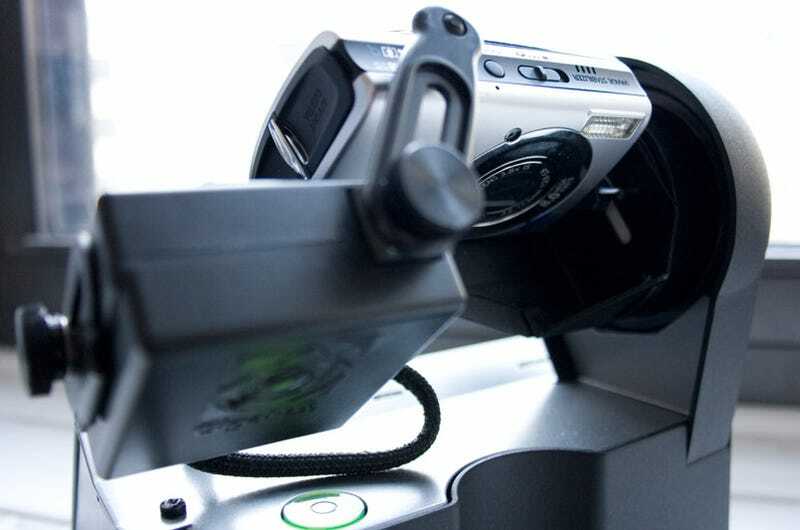 This can be easier said than done on the dummy point and shoot cameras that the Epic is designed for. And taking a large panorama is still a process that will take several minutes to complete, meaning that there's a good chance pedestrian will stop and stare into the lens in any public atmosphere you choose to photograph. Also, GigaPan's software essentially requires you to upload images to the web, then grab stills through that interface. A simple mega TIF output would have been a welcome option. UPDATE: Apparently I missed the export screen. Neat, right? You create a photo that can be zoomed in to the full potential of your lens while still maintaining a vast master shot. Here's the real issue: Manual overrides are reasonable for the average Gizmodo reader. What's tougher is that the battery life is atrocious. The Epic runs off of 6 AA batteries that, for me, took about 200 shots (or two panoramas) before dying. (GigaPan has assured me that premium batteries can take 1,000 pictures at room temperature.) Believe it or not, 200 shots is a limiting proposition, especially for the average guy who would be interested in this unit. I actually ran out of battery during my example shot—a whole column of photos is missing. Why would a company design such a functional product with such an obvious Achilles' heel? I can't deny that the GigaPan Epic is absurdly cool. And I can't wait for a sunny day when I can explore the city and grab some stunning, massive images through my dinky consumer camera. But I really don't want to find myself perched precariously on a ledge with the perfect shot, only to see the unit die with 60 pictures left to go. Then again, give me a heftier battery option and maybe some SLR compatibility, and it's on.